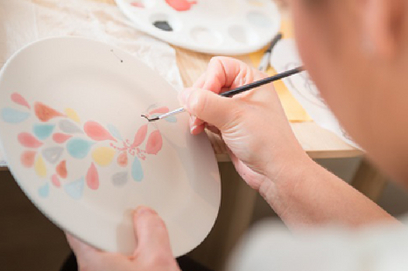 Our Pottery Making Hen Party is fabulous idea and ideal for a unique and classy afternoon activity. Each hen can decorate a piece of their choice such as their very own designer mug, a teacup and saucer, or your group can all work together to decorate a tea set or even an entire dinner set for the happy couple. We have a huge range of ceramic paints for your designer pottery pieces. We also provide folders jam-packed with designs to help inspire you, which you can even transfer onto the items using carbon paper if you so wish.All pottery painting packages include a free signature plate to present to the bride-to-be!Should you drop any paint on your clothes, it dries instantly and brushes off, leaving your hen party outfit perfect! For bookings of 15+, the price includes the pottery once baked in our kiln to be sent to one address via courier within Ireland 7-10 days later. If less than 15 people, there will be a small additional charge.